It all started in late February when we reported that a political row had erupted between China and Australia, with Beijing cracking down on imports of coal from Australia, cutting off the country's miners from their biggest export market and threatening the island nation's economy at a time when it and its fellow "Five Eyes" members who have sided with the US by blocking or banning Huawei's 5G network technology. In the weeks that followed, while Beijing disputed such a draconian export crackdown, China was overtly targeting Australian coal imports with increased restrictions – what Beijing claims were quality checks – that delayed their passage through northern ports. Given Australia has the highest level of income dependency on China of any developed nation as 30.6% of all Australian export income came from China last year, equivalent to US$87 billion (twice the trade volume with Japan, Australia’s next biggest trading partner), and Australia’s coal industry is deeply dependent on its exports to China, which account for 3.7% of Australia’s GDP, this prompted much speculation that Beijing is punishing coal companies as retribution for political acts by Canberra, one of Washington’s closest allies. "The last time Australia was so dependent on one country for its income was in the 1950s when it was a client state of Britain," Sydney Morning Herald’s international editor, Peter Hartcher Hartcher said in March, according to the SCMP. And while tensions simmered largely in private for the subsequent two months, they finally boil over in public when a Chinese coal industry official criticized Australia for biting the hand that feeds it at a coal conference in Beijing, in what the Sydney Morgning Herald declared was "a rare public acknowledgement that diplomatic tensions could be the cause of slowing trade." "You can’t earn Chinese money and then politically make irresponsible comments about China and become unfriendly," said Cui Pijiang, director of the China Coking Industry Association. "I’m afraid … this is something the Chinese government can’t tolerate." "Although businesses can conduct effective, friendly and reasonable cooperation between the two countries, the political factors have to be considered," he said adding that politics and the economy are always indispensable to each other. One audience member, clearly one who can't put 2 and 2 together and needs everything presented on a silver platter, said: "We’ve all been chasing this phantom of what’s driving this behaviour and this was a much clearer articulation – in an inappropriate forum." While "one audience member" may have been amazed by China confirmation that its behaviour was purely a political retaliation, we can only hope that it was clear to everyone else. Meanwhile, what we said above about how this situation should have been obvious to everyone, well strike that because as the SMH adds, Australian diplomats "have attended a spate of coal industry conferences across Beijing and Shanghai in the past fortnight to try to understand why Australian coal was facing a slowdown and try to determine how long it will last." And while Australia may now "know" what is behind the boycott of Australian coal, that doesn't mean the situation will get any better; in fact, it is only set to get even worse, as the conference heard that a restriction policy on overall imported coking coal levels would become tougher in 2019. Fenwei Energy Information vice-general manager Sarah Liu said China’s coal imports were 280 million tonnes last year, but the policy would restrict annual imports to 200 million tonnes by 2020. This target was "quite challenging", she said. And as imports of coal fell in 2019, domestic coking coal production would increase, she forecast. But one place that is sure to benefit from the escalation in trade tensions between Beijing and Canberra, is yet another Latin American nation that is slated to become China's next vassal colony. As S&P Global reports, Clombian thermal coal is proving attractive to Chinese buyers, who are picking up "super cheap" offers from producers and traders with around 1 million to 1.35 million mt of coal on its way to China from the South American exporter, plus additional cargoes to northeast Asian countries including South Korea. And with Australian purchase set to collapse - should the nation continue to antagonize Beijing with its pro-US bias - Chinese traders are wasting no time, and one of them is understood to have booked three Colombian cargoes for June arrival, adding up to nearly 500,000 mt, S&P sources. "There is 1 million mt of Colombian coal on its way to China," said one market source. 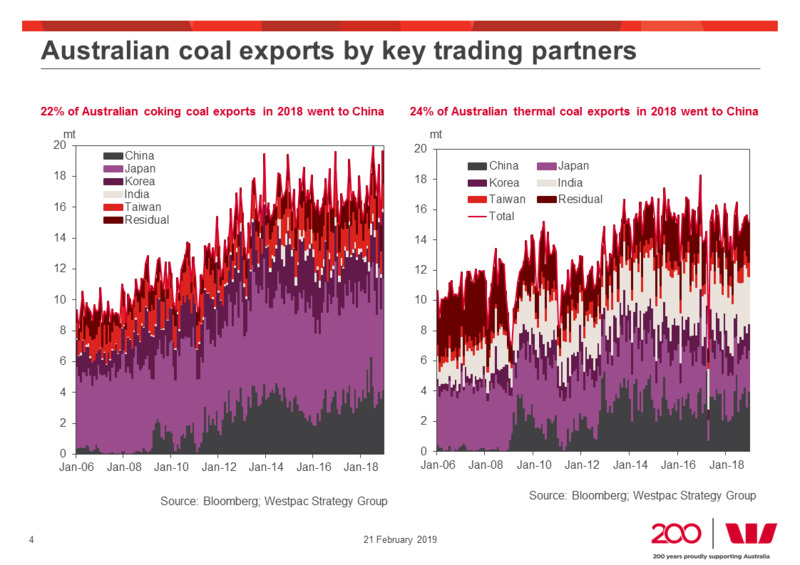 Meanwhile, there is a lot of Australian coal also on its way to China, the only problem is that due to the escalating diplomatic scandal, it just can't depart: one market source estimated that about 4 million mt of Australian thermal coal was waiting to enter Chinese ports in May and June. And while some have have expressed hope that China will lift its restrictions on Australian coal shipments at the end of May, this looks increasingly unlikely, especially after China's foreign ministry on Thursday criticized Australia's telecommunications legislation that allows "backdoors" to be installed. "It is baffling how the country concerned could whip up 'security threats' posed by other countries or companies ... while engaging in acts that endanger cyber security themselves," said Chinese foreign ministry spokesman Lu Kang, sending a clear message to Australia: if you continue to side with the US on the Huawei - or any other issue - you can keep your coal.